The Regular Grand Lodge of Belgium Temple Room. I was kindly invited to give a talk last Friday at Setantia Lodge which meets at Preston Masonic Hall and was lucky enough to have a tour of the Temple Rooms. Every Temple room I’ve ever visited has been unique, so I thought I’d list seven here that I’ve visited over the past couple of years. The Regular Grand Lodge of Belgium had a number of Temple Rooms, a fascinating history and an excellent library. Masonic artefacts could be seen along most corridors and in meeting rooms. I gave a talk here in May 2017 and my strongest memory is trying raw horse meat at the festive board, which was a local delicacy. The Temple Room at Neston Masonic Hall. A member of the general public may say that all Temple or Lodge rooms look the same, though a Mason would disagree as there are subtle differences; the size, the lodge furniture, the atmosphere and the ambience, there are indeed many differences. This Temple Room at Neston Masonic Hall in Cheshire, where I gave a talk at Cornerstone Lodge in April 2018, was very airy and was great for talks. The small Temple Room at Hoyle Court. Some Temple rooms are small and intimate, and the small Temple Room at Hoyle Court in West Yorkshire and home to Shakespeare and Equity Lodge was a great place for a talk. It was only a small lodge but being more intimate, it was more relaxed. Temple Rooms always have interesting charters and warrants on the walls, and for a small Temple, it had a number of interesting documents. Some lodge rooms just radiate history. The Temple Room at the Grand Lodge of Greece. Back in November 2016, I gave a talk to Parthenon Lodge at the Grand Lodge of Greece in Athens, which was a great experience; a full lodge room and plenty of history around, with artefacts on display and documents framed on most of the walls. The Temple Room was airy and spacious and the ashlars were, so I was told, made from the same marble that the Parthenon itself was made from. It was a beautiful lodge room with an elegant touch. The Temple Room at Elwy Hall in Rhyl, North Wales. 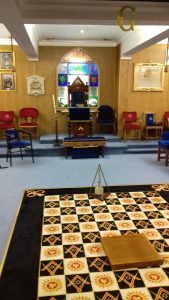 A talk I gave to the Welsh Installed Masters Lodge at Elwy Hall in Rhyl, North Wales, in June 2017 enabled me to see a slightly different Temple Room, one that was more modern with a modern carpet that added a slight quirkiness to the room. The squares on the carpet included a square and compass, and Masonic stained glass windows had been fitted to add an ambient light that made the room extremely relaxing. The Temple Room carried the voice surprisingly well, and even though it was full on a hot June day, the room was cool and airy. Temple Room at UGLE, London. A list on Temple Rooms is not complete without including one from the United Grand Lodge of England in London, and here is a great historical Temple Room that I’ve given a few talks in. The first time was in May 2017 when I presented a paper to Quatuor Coronati Lodge. The floor is not carpeted so acoustics are great, and the room certainly has a historical feel to it. Temple Room at Preston Masonic Hall, West Lancashire. The last Temple Room I visited and a must for inclusion is the Temple at Preston Masonic Hall. There were many Temple Rooms down various corridors, and this particular room was very welcoming, having a historical feel to it. I do appreciate visiting new Masonic Halls that offer many different styles and unique histories, and a thought that always strikes me is the many Freemasons that have met in them and the ceremonies that have taken place over the many decades.